The Brass Car Era occurred between 1890 and 1919, concurrent with the Electric Car Era and beginning of the Antique Car Era. It marks the beginning of automotive history, when steam engines had fancy brass fittings and brass lanterns were a natural addition to the new "horseless carriage". Brass cars were typically built with carriage wood and forged steel and fitted with electric motors or steam engines. 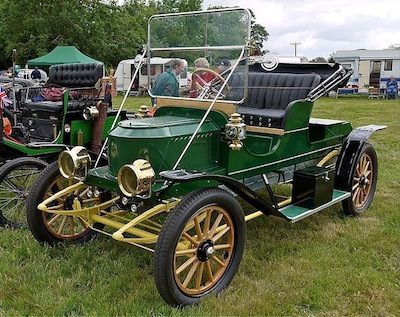 Most people associate the Stanley Steamer with "Brass" vehicles because they, like many other steam driven vehicles at the time, used a lot of brass in construction and to dress up the trim. 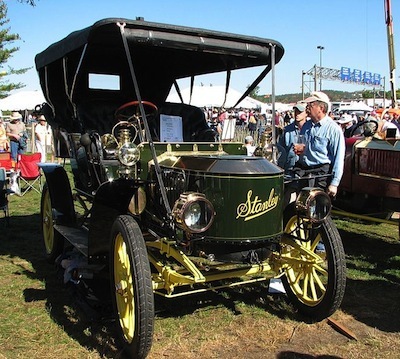 The Stanley brothers built their cars between 1896 and 1924 and sold second only to electric cars from 1899 to 1905. That was the time when thousands of wood-be industrialists were trying to build the ultimate driving machine so to come out on top was quite a feat. Following is a partial list of the manufacturers and vehicles that could be found during the Brass Car Era.